I get really upset when people who don't need wheelchair accessible cabin, having other bathroom stalls to choose from go for the one with the grab bars on the walls. I once waited 30 minutes to use the restroom by the locked door because somebody decided it would be a nice lounging area. Many people use them as changing rooms. Back in my law school days it became a big problem with students, mostly female dressing up for trial practice in court attire , noticeable enough that the administration put a sign on the door instructing them that this in fact was not a changing area. Such restrooms are big and comfortable, but they are like that for a reason. Most wheelchair users cannot easily and safely use regular cabins. That's why we usually have one that they can on one side . If you have a choice in the matter- and there are usually four, three stalls in a standard size American public restroom, please think that although it's not being used right now, a person in a wheelchair might charge it to use it in a minute or two. The man from my story had an entire mens room to himself, four empty cabins and yet he had me waiting for the one I could use. Because while he has a choice of any other partition in there I do not. And yes, years of rehabilitation have given me enough of balance and ability to work with my body to use a normal cabin if I had to, but not without embarrassment. This would require me getting on my all fours, getting my pants dirty or touching things you don't want to be touching and kicking my wheelchair out. All so some other guy can have a comfortable experience on his lunch break. But people do other things in them of course. They shave, they make private phonecalls, and routinely homeless people in the past have turned these into showering and sleeping areas. 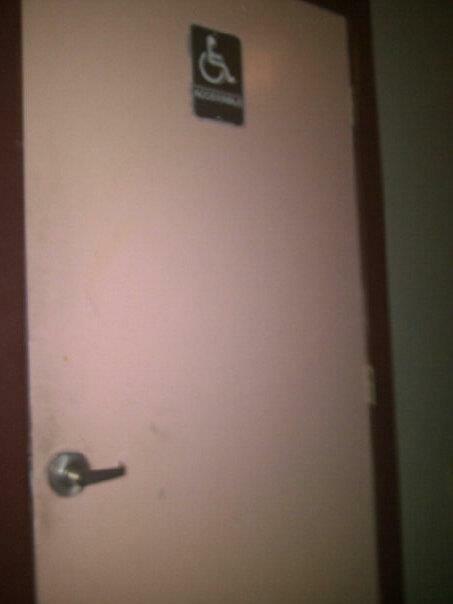 But restrooms are not the only disability accommodation abused by fully able people. This is a picture from last night of the ramp access to the Hippodrome Theater. It says do not block, but many do, using the bars as a bicycle rails. I'm actually surprised that there was only one, usually they're multiple bikes tied to both sides of the ramp. And it's not even the patrons of the theater that do it. Using the area as free parking they most often hop over to Boca Fiesta hipster restaurant on the other side. 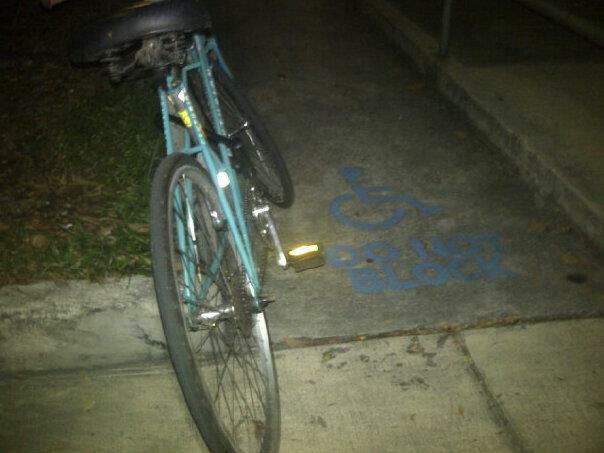 Finally, there's disability parking. If you park there without a proper tag, you get a ticket, end of story. But a private towing company that my apartment complex has hired to ensure that only residents park on the premises routinely uses those spots at night for their trucks. After I voiced my observations that they shouldn't park there regardless, I heard them say: "Are you using it right now? It's 2:30 am". I don't care what time it is. And that's kind of not the point. Anybody would've been ticketed in that spot. And, oh irony, they parked there while they were looking for cars that were there without a permit that they could tow away. I think it's a matter of consideration, kindness and common sense. Those things are for my necessity, not your comfort. And since we're on the topic of restrooms. Please remember that it may take longer for people with some disabilities to use a restroom and knocking and rushing is probably not helpful. Also some conditions may require them them to use a bathroom more urgently and suddenly than most people.